Hunter Clarke wanted one thing for Christmas: to spend it with his dad and his brother. He misses being included in any guy trips since his parents divorced and he went to live with his mom. So he’s less than happy when his mother tells him that he won a contest to spend Christmas in West Monroe, Louisiana, with a family named the Robertsons. For some reason, they’re supposed to be a big deal. How did he win a contest he didn't enter? Besides, he’s never heard of them and sure doesn't want to spend Christmas in a swamp with a bunch of strangers. We are Duck Dynasty lovers here in the household. There aren't that many shows that promote faith and prayer and when we find one that does, we become faithful viewers. I knew I would love to read this book and especially now, when we're not quite yet in Christmas season but we can see it down the road. I loved this book from start to finish. I honestly couldn't put it down, what a great read it was! Who wouldn't want to spend Christmas with the Robertsons? Have you ever wondered what their holidays look like? Not only will you get a peek into this great Christian family, this work of fiction gives us a glimpse into the Robertson family traditions that we all wouldn't mind partaking of. 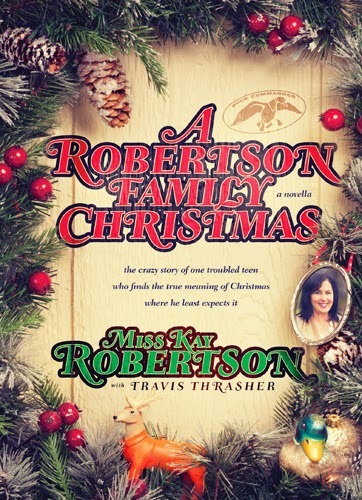 Miss Kay Robertson has gifted her readers with a beautiful story of a loud, loving, family that shares a few days with a "city boy" and teaches him it's all right to make mistakes and show emotions. This book is truly a blessing to read. The humor and the family dynamics are outstanding. Hunter goes back to Chicago a different person; one that is aware of the love of his mother and especially of the love of Jesus Christ.